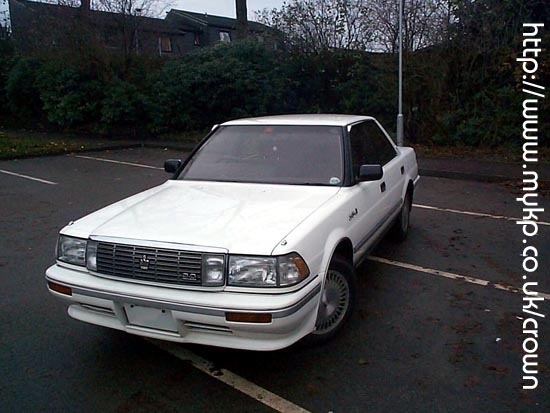 This page is all about what used to be my Toyota Crown, a 1989 MS137 and includes pictures, technical info, a few trials and tribulations, how I got my Crown and the problems I have had since I got it (mainly how to import into the UK). 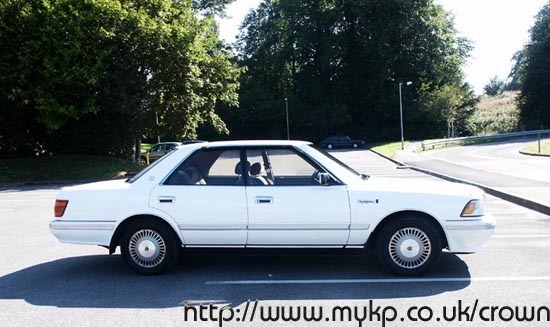 My Toyota Crown is a 1989, MS137 Royal Saloon model with the 3 litre straight six engine and 4 speed automatic gearbox with overdrive. It’s White with Light and dark brown interior, nice!. Actually its more fo a chocolate colour. 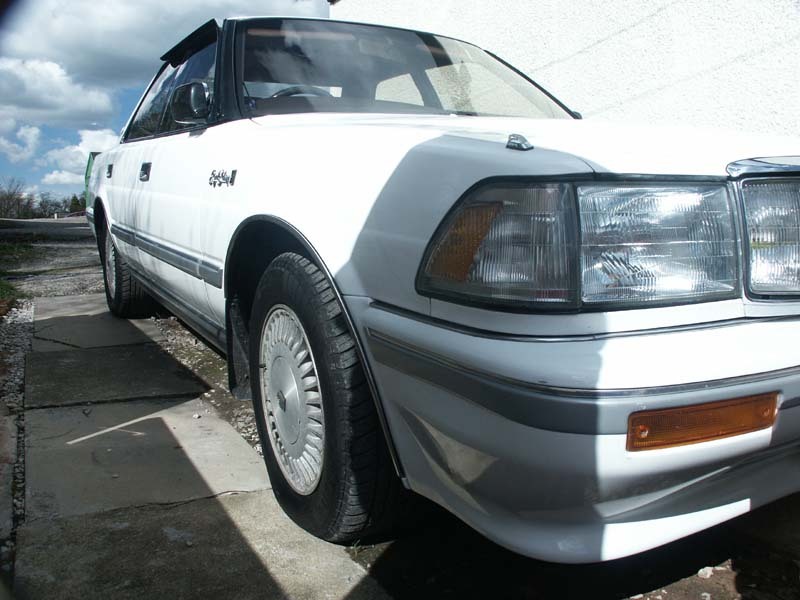 Nearly everything on the car is as from the factory and the only two things that aren’t OEM spec are the stereo (the pre-amp for the CD broke and I can’t find anywhere that can fix it) and the exhaust has been replaced with a stainless steel one. 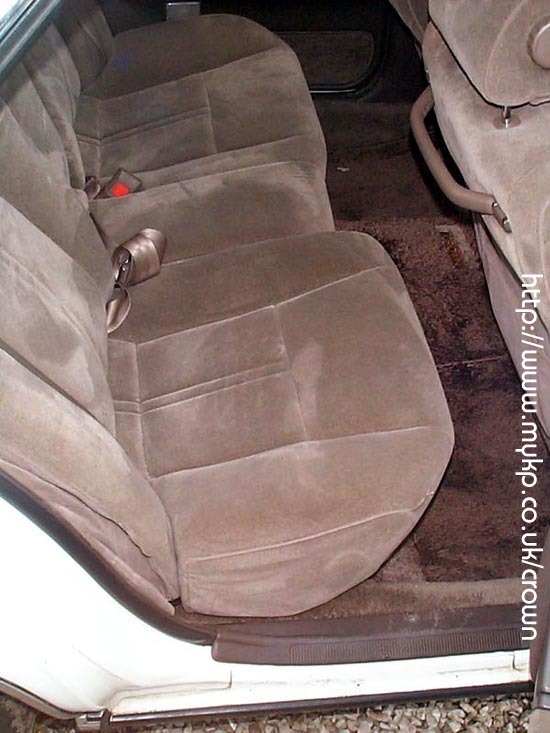 Since new the car has done just over 75000 Km (March 2003) that’s 46,875 miles, not much you’ll agree. 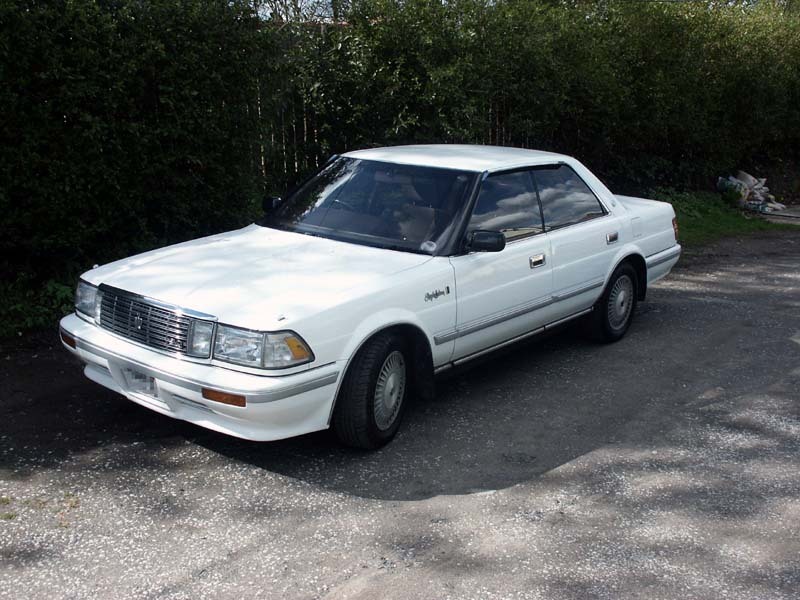 My brother in-law, who was the previous driver (The car was my in-laws company car), has done a really good job of keeping the car in Mint condition (you should see his Toyota Parado and Toyota Bb there both in superb condition. The carpets in the drivers well of the Crown, aren’t even slightly worn or dirty!! 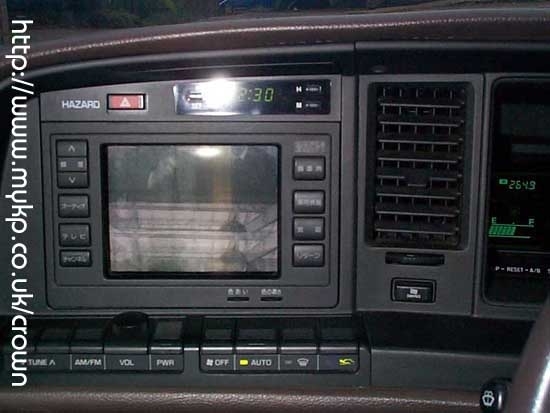 LCD Screen/TV (Yep, you read correctly, I know you can get them now but this car is a 1989 vehicle), plus this doubles as the Car/engine diagnostics screen and the Satellite navigation console. Its even touch screen! Reclining rear seats The rear seats actually recline for greater comfort, although I wouldn’t use it, if your sat behind a tall driver! heating system You can set the temperature different for front and back. 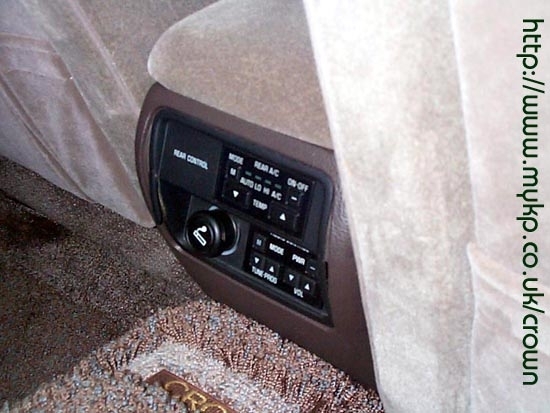 Remote control stereo Exactly that, a remote control for the car stereo, it also has controls for the back seat passengers. (from the drivers seat) I know you can get this, (one of my previous cars had it, but you had to adjust it on top of the shocker though), but you can control the suspension from the comfort of your seat. The suspension is also self leveling. 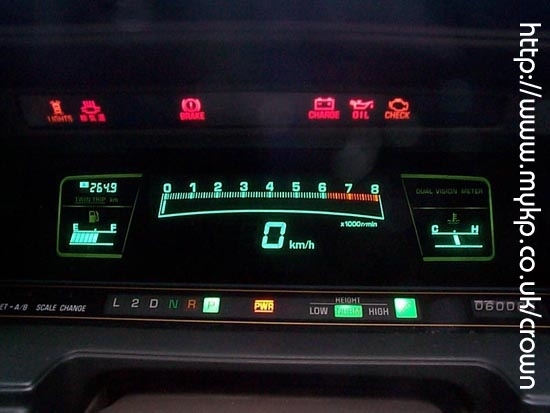 Digital dash board Still don’t see this much today! 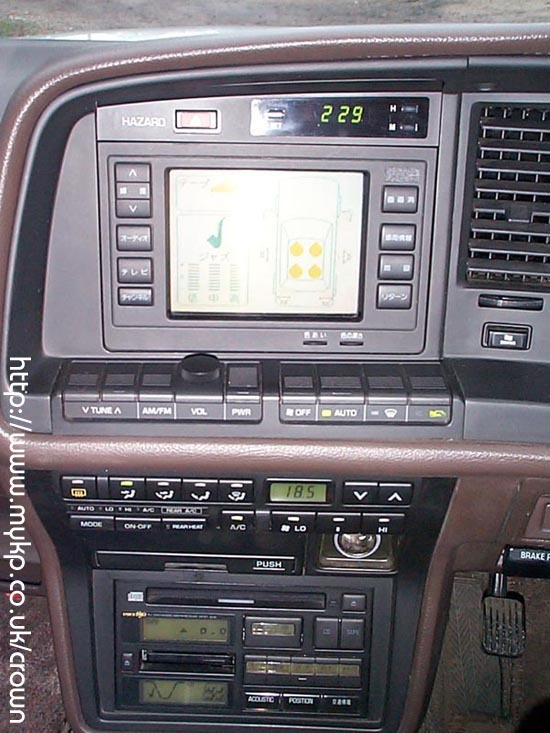 Again, remember this car was built in 1989 and some of the stuff you can’t even get on modern cars…. 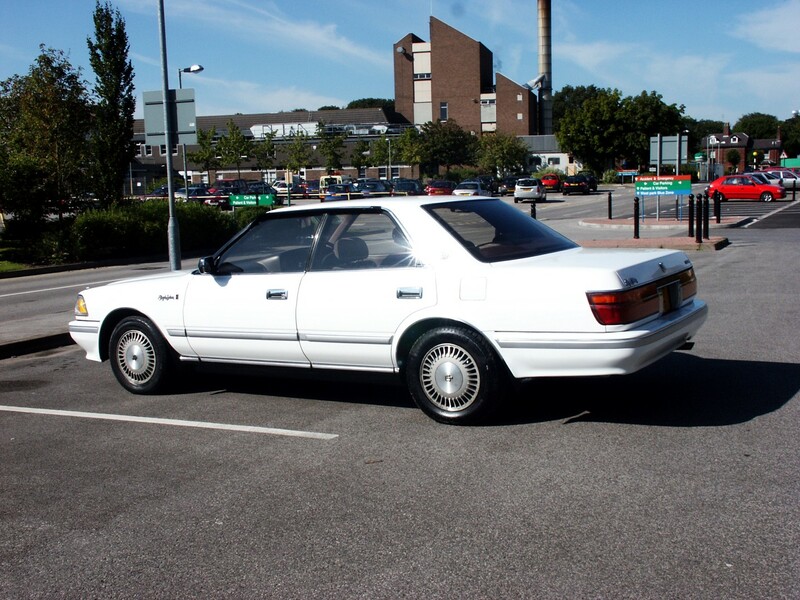 Just a quick note: If your thinking about importing a car then think about this first. This is a big problem as some of the UK dealers will distance themselves from anything that has the word import on it. Mainly because they haven’t had there pound of flesh from your car. 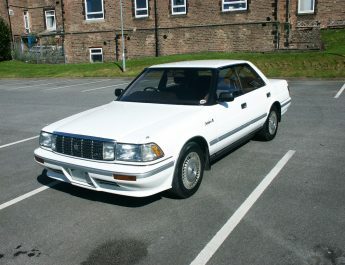 (Remember cars in the UK are more expensive then elsewhere, especially Japan). 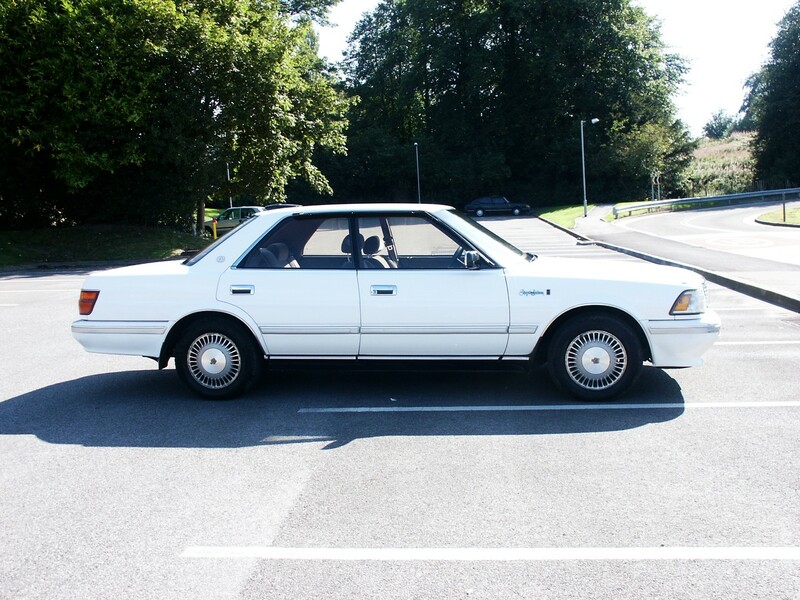 For more information see my Japanese Import page here…. 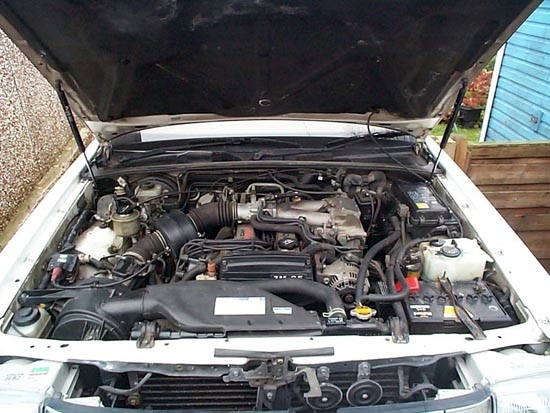 When I first started using my car I needed to get it serviced and my local Toyota dealers point blank refused to service my car saying “Its an import, and we do not have the parts and/or tools needed to service your vehicle”. In the end I had to take my car to a small local garage who had no problem servicing the car and I would recommend him to anyone..
Norman Motor Services, Albion Mills, London Road, Macclesfield. 01625 618384, Ask for Andrew and tell them Crown Mike sent you. Anyway, here are a few pictures of the beast. How did I get the car? The car was originally registered in Japan and was my in-laws companies, company car and it was given to us as a wedding present, even though we were 6500 miles away in England. 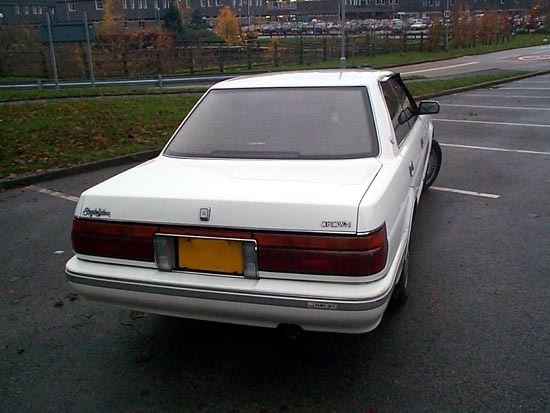 They even de-registered the car (a process of removing and unassigning the number plate from the car) on our behalf and put it on a freight ship bound for the UK. This cost them about £600. 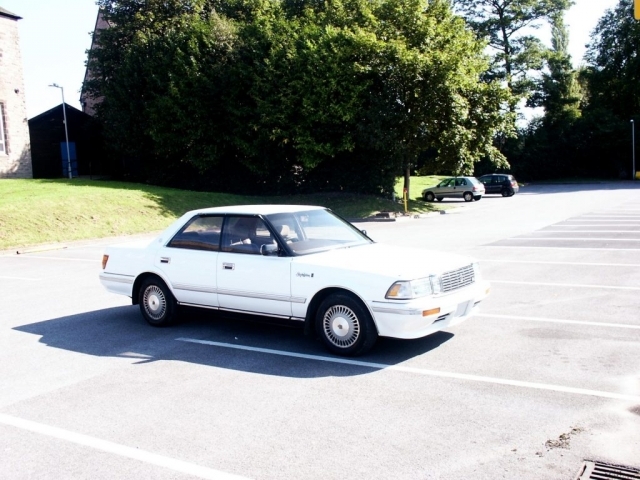 (cheap for such a large car.) Remember if your sending freight by sea you pay for the space not the weight. Note: In Japan when a car is sold from customer to customer the car must have the license plate un-assigned and a new one assigned to it. If you visit japan you will usually second hand cars with no license plates on them on garage forcourts. Six weeks later the car arrived in England at Southampton, then the hard work begins. First thing is to get your checkbook out! As well as having paid to get the car here you have to pay import duties and handling charges to the courier at this end and the finest of Her Majesty s Custom and Extortion Dept! Bye, bye about £1000. The fun or paying out doesn’t stop once you get the car home either, again keep your check book handy because your going to need a Single Vehicle Approval Test (SVA) which costs £165 and isn’t as tough as the MOT, although it usually depends on the mood of the examiner as to whether the car passes or not, not what is wrong with the car. You will only need this if the car is less than 10 years old. As mine wasn’t quite 10 years old, I waited for 4 months. (£165 is better in my pocket than the government’s). Once you’ve got your SVA you’ll need to get an MOT £37.50, register the car for £25 at the DVLA and once its registered get car Tax £155. 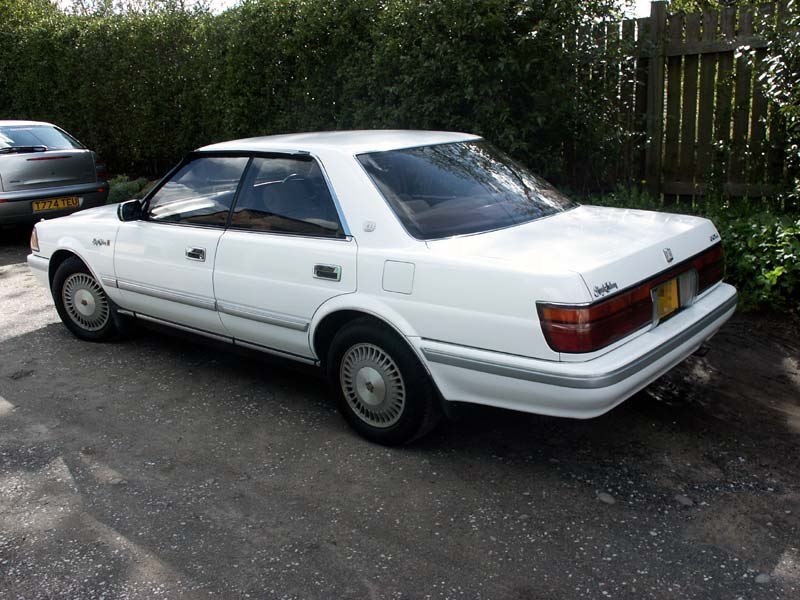 Once done wait a few weeks while the DVLA scrutonise and dither over your application and then you’ll get your log book and finally be able to drive it. Other costs incured will be things like getting a translation of the Japanese Deregistration Certification (Do this in Japan, otherwise you’ll have to pay the Japanese embassy in the UK to do this and they charge £25, its free in Japan). So it wasn’t exactly a free car in the end. (still it’s a great car). 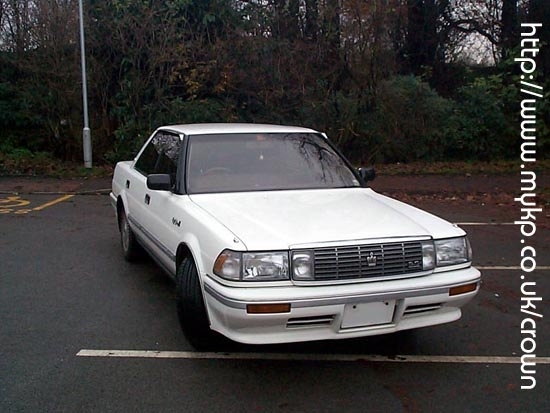 So, why do I like the Toyota Crown? I think it stem’s from me liking to be different, I have had some pretty unusual cars in my time and this one is no different. Sure I could buy another car, but the fact that I would see other cars the same as mine allday and everyday doesn’t appeal to me. 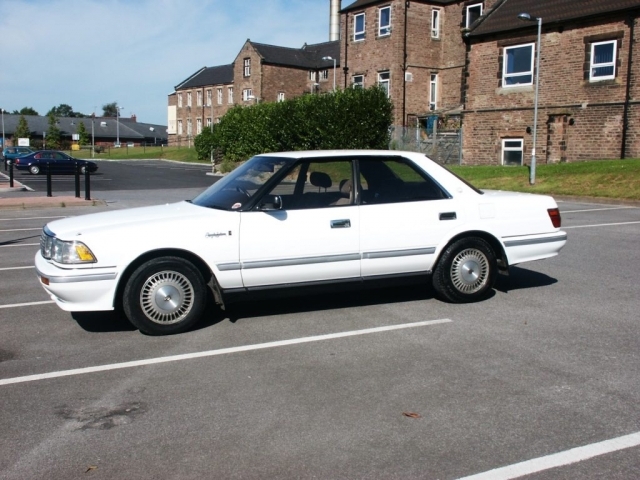 So, for this the Crown is superb as I have been driving around in it for 3 years now, done 35,000kms (20k miles) and have yet to see another Crown in the UK. 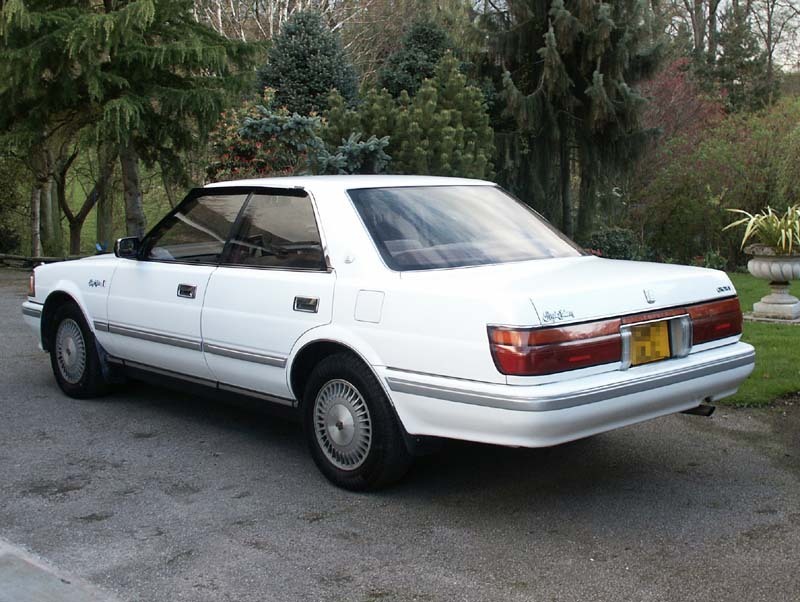 I know there are other Toyota Crown’s in the UK, (4, MS137’s like mine, according to DVLA) but I haven’t see any. I don’t know of many cars that you can say this of. Where ever I go I usually get people stop me and ask me “What’s that”,”That’s nice where did you get it from?” or “Is that American?” I have even had offers from people wanting to buy it! Even my father and one of my mates want me to give them first refusal if I sell it. The other thing I like about the Crown is the comfort. Whether its just driving home or going long distance the car always feels nice and easy to drive and cossets you with its comfy seats, quite ride and smooth as silk auto-box. The other advantage for me is, its slowed me down. My previous car was a Renault 19 16v, a pretty fast car for its time (0-60 in 7.6 secs) and I did drive it like it was supposed to be driven, earning myself 6 points on my license in the process. 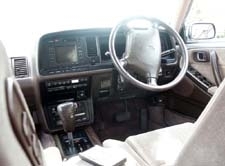 However as the Crown always feels so unrushed and is so comfy to drive I don’t tend to speed anymore, not that you couldn’t in a Crown (I assure you you could, the Crown might be big but its still fast, I ve had over twice the speed limit out of it once! ), I just can’t be bothered to speed any more. The Crown makes you want to waft along, rather than race. I have only had two major problems with the Crown since I got it and the first was the exhaust. Due to the car having only done small trips whilst it was in Japan the exhaust had basically corroded from the inside to the out. This is a common problem on all but the latest Crowns as condensation inside the exhaust isn’t evaporated if the engine is only run on a short journey. Apparently the exhaust doesn’t get hot enough to evaporate any water in the system but 10 minutes and over is usually long enough to do this. However, on my car the problem started about 10 months ago with the exhaust suddenly starting to blow then gradually getting worse and worse. Now as there isn’t anywhere that sells off the self exhausts for the Crown I approached a local company, JP Exhausts (01625 619916) or http://www.jpexhausts.co.uk/ who said they could make me a replacement in stainless steel for the sum of £390. I could have got one from Japan for around the same price (with the cost of shipping & Import Tax included) but they wouldn’t last as long as this. 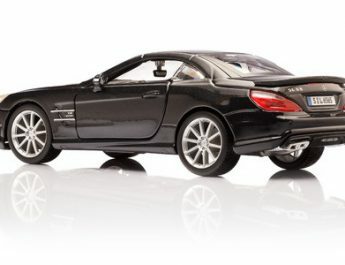 The company gives a 5 year gaurantee with its stainless steel exhausts, so I consider this a good deal. JP Exhausts also make exhausts for other make and models as well as making custom exhausts to suit your specifications. 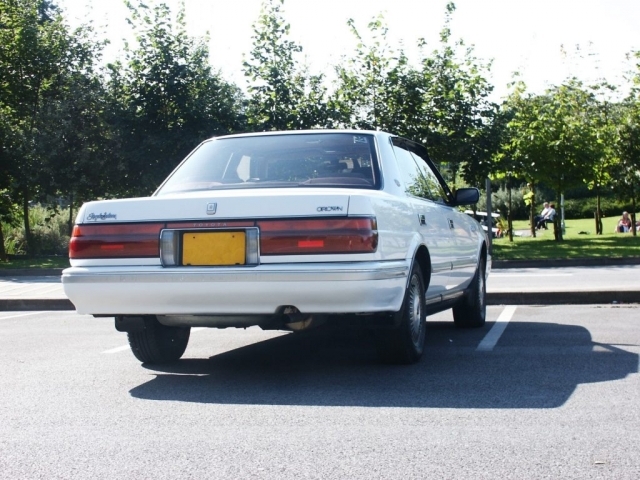 Secondly, I have recently had problems with the back suspension bushes. One of them had broken, by broken I mean the rubber has perished, and I ended up with a three wheel steer car! Scary..
A few phone calls to my brother in law in Japan, got me the required parts and they arrived 4 days later. They where fitted and now I’m back on the straight an narrow again. If you have a Crown and want to talk/communicate/ask questions about your or others Crowns. Or perhaps you want to look at other Crown models, then it might be worth you having a look at the Classic Crown Web Site. 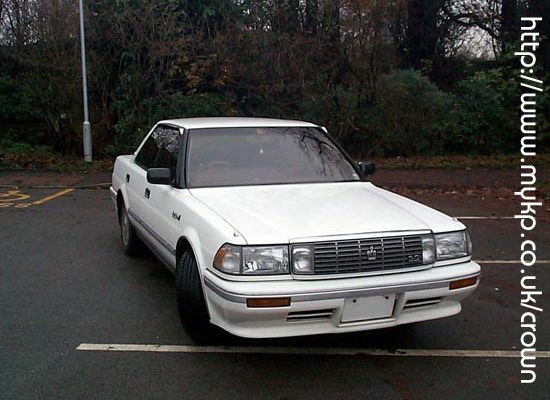 If you live in the UK and have a Japanese car then you should join the UK Japanese car club, more details can be found here.